So Goliath emerged unscathed, David was sent back to the Highlands licking his wounds. 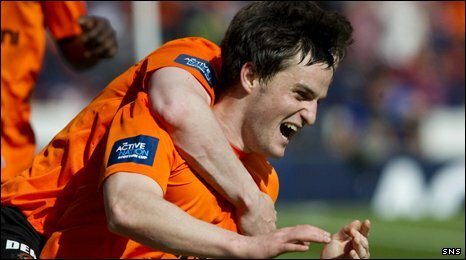 Congratulations to Dundee United. They were below par. But they managed to keep their heads and they were deserving winners. Three good finishes as well, from Goodwillie and twice from Conway. The game itself was a disappointment. The first half especially seemed oddly flat. United looked nervy at being favourites and resorted to a long ball game that doesn't play to their strengths. County also seemed unsure of themselves. Were they overawed by the occasion? Perhaps, but they would also be aware that the surprise factor disappeared when they beat Celtic. They remained underdogs but now they had the weight of expectation as well, they were known giant-killers. Whatever the reason they failed to perform, couldn't find their natural game. When United emerged for the second half they had more confidence, suddenly they looked like they felt they had less to fear and they dominated. You always felt that it was only a matter of time. And that was to be expected. There is a big gulf between these two teams, United 3rd in the SPL and County only 5th in the First Division. You'll struggle to find a United fan who cares about the quality of the game. They'll be celebrating, a cup win and their emergence as the current holders of the "third force" crown. Now they'll be looking at the board to keep the team - and manager - at Tannadice. It feels patronising to say that Ross County did well just to get there. But they did and that, rather than a poor performance today, should be the memory they take from their run. Judging by the way they stayed, even at 3-0 down, to applaud the players they are already thinking that way. Nor did United want County to dominate the "romance of the cup" stories. Lee Wilkie led the team out and helped captain Andy Webster raise the trophy. Chairman Stephen Thompson was obviously thinking of his late father Eddie as he celebrated. Lots of stories. A good day. Not an Old Firm team in sight and two teams that can look back on seasons to be proud of. It niggles now that game didn't deliver as we would have liked. That will soon be forgotten. This season - for both teams and their fans - won't.